Update, January 10: Overwatch League skins are still pricey, but you can get a bonus 100 tokens by signing up for the Overwatch League newsletter. Signing up to the Overwatch League newsletter with your battle.net account will reward you with 100 OWL tokens – just enough to get you an extra free skin. Find out more with our full guide to the Overwatch League. You can sign up for the newsletter, which promises to provide you “updates from Overwatch League and your favourite teams” on the official OWL site. The offer is open until the end of January, and means that you can net a total of two free skins, thanks to the other 100 tokens you get just by logging in. A Reddit thread about the deal, however, does suggest that it’s not an entirely automatic process. The thread highlights the small print which says that “your Battle.net and Overwatch accounts must be in good standing,” and that it might take several days for your tokens to arrive in your account. Update, January 9:Overwatch League team skins are live, and they’re pricey. With the first season of Overwatch League kicking off tomorrow, Blizzard are finalizing the last few details ahead of the games. Earlier today they (finally) announced a broadcast partnership with Twitch, and now they’ve updated the game itself with plenty of team colour skins for you to show your support. 312 of them, to be precise, and if you want more than one of those skins you’re going to be paying a steep price. 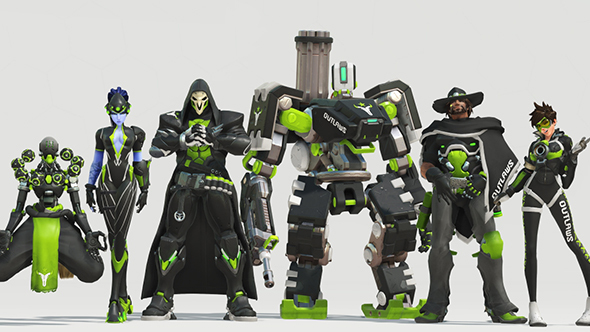 Each of the twelve teams has a skin for each of the 26 heroes. That naturally means there are 26 skins for each team, for a total of 312 skins overall. Each skin costs 100 “League Tokens,” and you’ll get enough tokens for a single skin the first time you log in. After that, of course, you have to pay, with $4.99 / £4.99 netting you the 100 tokens necessary for one skin. The “best value” package provides 2600 tokens for $99.99 / £87.49, giving you enough tokens for a team wardrobe across Overwatch’s entire roster. If you want to go truly off the deep end and buy every single skin for Overwatch League, you’re looking at an investment of $1200 / £1050. Hey, at least that money is going to support the League’s teams, and they’re significantly cheaper than real jerseys. You can’t keep warm in digital skins, admittedly. Blizzard have also begun streaming a preview show highlighting the opening week action, and as of the time of this post you can see that live below. Original story, December 4:Overwatch League starts in earnest next month, but preseason play begins in just a few short days. And just like the traditional sports the League draws from, the new organization will feature plenty of merch to keep things funded. Teams in the League will be represented by unique skins with representative jersey-style colours for each team, and everyday Overwatch players will be able to buy those skins and support their teams. Starting in early 2018, home team uniforms for all twelve teams in the inaugural season will be available for each of the 26 heroes, and proceeds from the digital purchases will help to fund your chosen team. The game will be getting a new set of League Tokens to support these purchases, allowing players to directly buy the exact League skins they want, a major contrast from the loot box system used to unlock most of the game’s normal skins. According to League commissioner Nate Nanzer, this currency is being put in place to help account for where money from League-related purchases should go. Players who log in during the first month after the system implemented will be rewarded with enough League Tokens to purchase one hero skin. You can get a preview of Overwatch League action with preseason play starting December 6, but it won’t fully begin until the regular season starts on January 10.